Alice K. (McGinn) Fenton in Woburn, November 1st, 2018 at eighty eight years of age. Beloved wife of the late Norman L. Fenton. Loving mother of Lane Fenton, his wife Terri of Woburn, Bruce Fenton, his wife Donna of Townsend and Barry Fenton, his late wife Deborah of Bedford, NH. Dear sister of the late Edward, Mary and Robert McGinn. Cherished “Grams” of Tracey, Dawn, Jason, Nicole, Brian, Shawn, Laura and “Great Grams” of Kaleb, Gabriel, Killian, Brantley and Garrett. A Funeral will be held from the Lynch-Cantillon Funeral Home, 263 Main Street, Woburn on Tuesday, November 6th at 9 a.m. followed by a Funeral Mass in St. Charles Church, 280 Main Street, Woburn at 10. Relatives and friends are respectfully invited to call the Funeral Home, Monday evening 3-7 p.m. Remembrances may be made in honor of Alice to the Alzheimer’s Association, 309 Waverly Oaks Road, Waltham, MA 02452. For directions or to leave an online condolence, please visit www.lynch-cantillon.com or Facebook under Lynch-Cantillon Funeral Home. 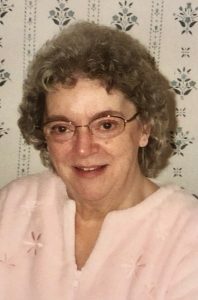 Alice K. (McGinn) Fenton passed away at Aberjona Nursing Center on Thursday November 1st. The beloved wife of the late Norman L. Fenton, she was eighty eight years of age. Alice, a life long resident of Woburn was born in the South End of the City to the late Edward and Elaina (Hanlon) McGinn. Alice had attended Woburn Schools where she was a graduate of Woburn Senior High School, along with the class of 1948. Shortly thereafter, she went on to meet a young gentleman by the name of Norm, at a dance with some friends. They would go on to marry, which spanned over sixty two years wonderful years. Together they went to the Central Square area of Woburn, where they made their home and started a family, bringing three great sons into the world. As a family, they joined in many outside activities together. Skiing was one of their all time favorite activities to do together, Twin Mountain being their favorite spot. In retirement, Alice became very involved in the St. Charles community. She would help organize anything and everything, from festivities, Bazaars, dinners and other social activities at the church. Alice and Norm had a passion for traveling. They enjoyed travelling all over the world, including Ireland, Switzerland, Germany, and Bermuda, just to name a few. Alice’s love, kindness, and motherly spirit, was exemplary. Spending time with her family, especially her grandchildren, was truly one of Alice’s greatest joys. Sadly, Alice was predeceased by her husband, Norm and her siblings Edward, Mary and Robert McGinn. She is the loving mother of Lane Fenton, his wife Terri of Woburn, Bruce Fenton, his wife Donna of Townsend and Barry Fenton, his late wife Deborah of Bedford, NH. Cherished “Grams” of Tracey, Dawn, Jason, Nicole, Brian, Shawn, Laura and “Great Grams” of Kaleb, Gabriel, Killian, Brantley and Garrett. A Funeral will be held from the Lynch-Cantillon Funeral Home, 263 Main Street, Woburn on Tuesday, November 6th at 9 a.m. followed by a Funeral Mass in St. Charles Church, 280 Main Street, Woburn at 10. Relatives and friends are respectfully invited to call at the Funeral Home, Monday evening 3-7 p.m. Remembrances may be made in honor of Alice to the Alzheimer’s Association, 309 Waverly Oaks Road, Waltham, MA 02452. For directions or to leave an online condolence, please visit www.lynch-cantillon.com or Facebook under Lynch-Cantillon Funeral Home. Very sorry to hear of your Mom’s passing, your parents were fine people!